(May 19, 1944) - A telegram from the war department yesterday brought Mr. and Mrs. F. E. Shaw of Passaic avenue, the news that their son, S. Sgt. Richard E. Teeple of the Army air force, has been reported missing in action over Greece since April 25. No further details were given. Sgt. Teeple had previously been awarded two medals, the Distinguished Flying Cross and the Purple Heart, in August of last year. On June 5, 1943, when he was a radio operator and gunner on a B-25, his plane was shot down fighting over Pantelleria, Sicily. Although wounded himself, he pulled a friend from the sinking plane and put him on a life raft. For this act, he was awarded the D.F.C. Hospitalization from June 5 until Aug. 29 suspended his active service in the air corps temporarily. Sgt. Teeple enlisted in the army on June 11, 1942, and took his basic training in Scott Field, Ill. He went overseas in March of last year, first to South America, and then to North Africa. While in North Africa, he participated in bombing raids over Europe, and at the beginning of the new year was transferred to a base in Italy. Since his transfer, however, he had been doing reconnaissance and liaison work instead of participating in bombing missions. It is supposed that he was on some liaison mission when his plane was downed on April 25. 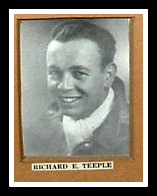 Previous to his enlistment in the air force, Teeple was employed at Foot Pierson, Newark, makers of radio parts for bombers. He was a graduate of Nutley high school. He has one brother, Charles Jr., a junior at Nutley high. (Dec. 1. 1944) Word that their son, S/Sgt. Richard E. Teeple, previously reported missing, was killed in action April 25 over Greece has been received here from the War Department by Mr. and Mrs. F.E. Teeple of Centre Street, formerly of Passaic avenue. S-Sgt. Teeple was a radio gunner on a B-25 and was based near Naples. From friends of the son, Mr. and Mrs. Teeple have learned that the plane with a crew of seven, took off at night on a reconnaissance trip and ran into a storm over the Balkans, crashing into a mountain. All were killed except for the navigator who remained with the Greek underground for a time and eventually worked his way back to his base. The young man would have been 22 years old on New Year's Eve. (March 30, 1945) - A Distinguished Flying Cross and an Air Medal with three Oak Leaf Clusters, posthumously awarded S-Sgt. Richard E. Teeple were presented to his 16-year-old brother Charles of Centre street, last Thursday in ceremonies at Weequahic park Newark. S-Sgt. Teeple's father, Frank E. Teeple, was to have received the awards but was unable to attend because of illness. Mrs. Teeple accompanied her son, Charles. S-Sgt. Teeple was reported missing in action over Greece April 25, 1944, and later his parents were notified that he had been killed in action that same day. 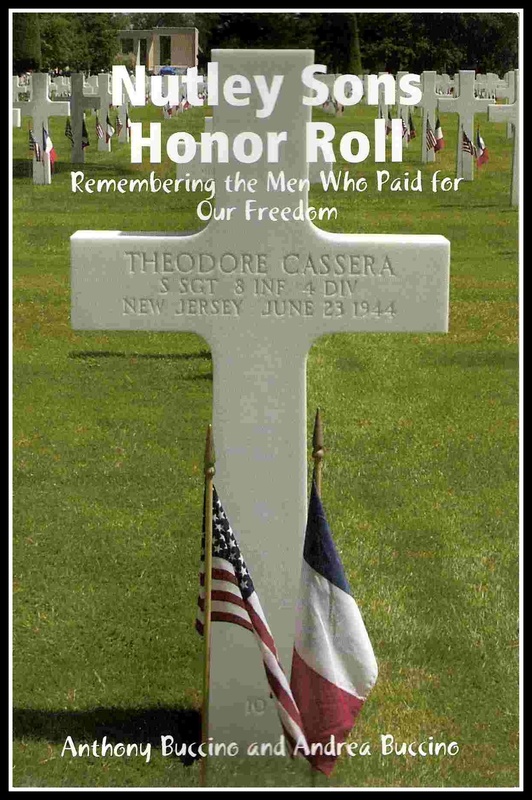 He was graduated from Nutley High school and worked at Bendix and Foote Pierson in Newark, makers of radio parts for bombers, before entering service. "For extraordinary achievement while participating in aerial flight in the North African Theatre of Operations as radio-gunner on a B-25 type aircraft. While over Pantelleria June 5, 1943, his formation was heavily attacked by enemy fighters and his plane was severely damaged. Although painfully wounded in the head, arms and legs, and with the electrical control system of his guns destroyed, Sgt. Teeple steadfastly remained at his post. Expertly manning his damaged guns, he played a conspicuous part in warding off repeated fighter attacks. When his aircraft crash-landed on the seas, regardless of his own wounds, he carried an injured comrade out of the plane, hoisted him into a life raft. His resolute courage and his unfailing devotion to duty have reflected great credit upon himself and the armed forces of the United States." The Air Medal with three Clusters was awarded for meritorious achievement on missions against the enemy.